Giovanni was born on the tiny island of Pellestrina, Italy, which is just a boat ride away from Venice. Being the son of a commercial fisherman, he grew up eating fish every day. During his school years, he spent most of his time (after homework was done, of course!) in his uncle’s woodshop, while summertimes were spent dedicated to helping his father harvest black mussels from the Venetian lagoon. After graduating from Merchant Marine School in the ’80′s, he got a position as a Deck Officer with Carnival Cruise Line. That’s where he met Jill; on board the M/S Tropicale in Los Angeles. After realizing that salt water will eventually take a toll on those little screws in your head, Giovanni and Jill decided to get married! In 1991, they moved to Venice, but soon realized that people who grow up in corn fields (Jill is from Ohio) do not survive well on islands. So they moved back to the States in 1994 and while Giovanni wasn’t having any luck finding a job in the maritime field, he rediscovered his passions for woodworking and photography, and the art of framing became his new goal. Giovanni soon got the opportunity to work right here at Let Us Frame It with Cathey and Sam Bowers, who were the original owners since 1978. Things worked out great for him and Jill soon became part of the team. 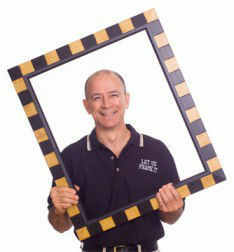 After the former owners retired, Giovanni and Jill became the happy new owners of Let Us Frame It!